Typically, when a team outshoots the other 49-23 — including 21-9 in the third — the outcome is predictable. Unfortunately, these things seem to happen to the Caps more often than not in the playoffs. The Caps fairly dominated from the puck drop in this one, generating good chances early and often against Pens rookie goalie Matt Murray. Murray (47 saves) answered everything early, turning away shot after shot while the Penguins benefited from a couple of Caps miscues and a couple of lucky bounces to build a 3-0 lead late in the second frame. The Pens opened the scoring at 6:37 of the first. A poor clearing attempt by Nick Backstrom ended up back in the Pens right wing corner. It was dug out and sent to Trevor Daly at center point. His blast was tipped by Patric Hornqvist on the way through the slot and sneaked behind Braden Holby for a 1-0 lead. Exactly one minute later it was 2-0. A long lead pass by Kris Letang got past Backstrom at center ice — who went for the steal — and ended up with Matt Cullen on the left wing. Cullen was cutoff by Matt Niskanen and the defender deflected Cullen’s entry pass. Unfortunately, the deflection ricocheted off Tom Kuhnhackl’s back and into the goal past the exasperated Holtby. Yup, it was like that. What came next is what everyone will be talking about the rest of the series. After a routine dump-in into the left wing corner, Letang stepped into an unsuspecting Marcus Johansson late, nailing the Swedish centerman on the chin, sending him spiraling. The hit was very reminiscent of the play that earned Brooks Orpik a three-game suspension for his hit on Olli Maatta in Game 2. From the replay, it’s fairly obvious Letang was late with the intent on hitting Johansson high and leaves his feet to finish the check. Letang was assessed a two-minute interference penalty, which the Caps squandered. Johansson left the game and did not play the rest of the period, but returned at the start of the second and played — well — the rest of the game. The NHL Player Safety committee will no doubt review the hit by Letang, and it will be fascinating to see what — if any — supplemental discipline will be handed out considering the suspension to Orpik. There are two big differences between the plays: 1) Johansson returned to the game, Maatta did not; and 2) Orpik weights 240 pounds, delivering a heavier blow which no doubt contributed to Maatta’s injuries. Meanwhile, the Pens made it 3-0 with a tick under five minutes left in the frame. Nate Schimdt tried to clear from behind his net up the middle, and did little but set up the Penguins. His pass went straight to Phil Kessel, who fed Nick Bonino on the right post. Bonino held until Holtby (20 saves) committed, then slid the puck through the crease where it ran into Carl Hagelin’s stick, and redirected it into the open goal — with Schmidt sprawled into the net in the process. In the third, the Caps continued the barrage but Murray continued to gobble up everything thrown at him. That is, until the 8:02 mark when Alex Ovechkin finally solved the rookie with a wicked wrist shot that whizzed by the kid’s head to cut the deficit to 3-1. 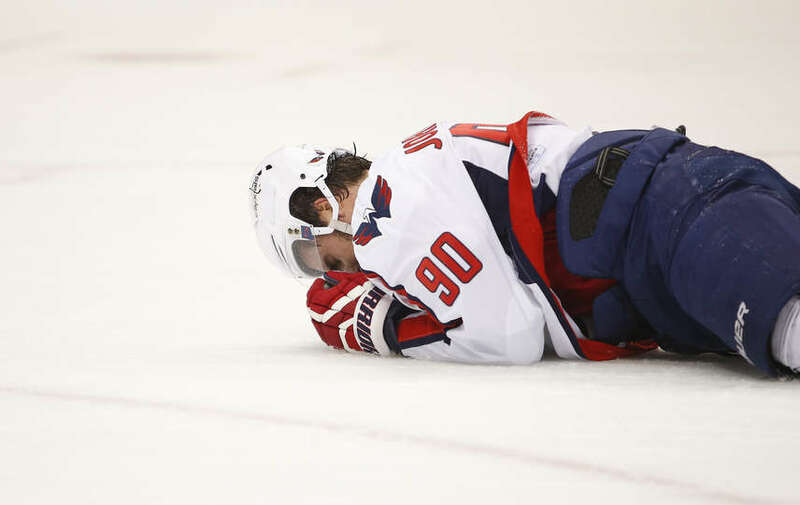 On the night, Ovechkin had a goal, assist, nine hits and 18 shot attempts ( seven on goal, six more blocked). The Caps drew to within one with 53.9 seconds left in the game — with Holtby pulled for an extra skater. A scrum behind the net sent the puck to Backstrom in the right corner. He passed to Carlson at the point, who fed Ovechkin for a one-timer from the opposite point. Ovechkin hit the far post, but the rebound caromed right to Justin Williams, wide open on the left post. Williams easily pushed it home to make it 3-2. Almost a minute of more frenzy remained, but the Caps didn’t find the equalizer. The Capitals found their game in Game 3, but it didn’t give them the result they needed. Down a game now in this best-of-seven series, it’s on to Wednesday night for the Caps to try to find a way to get to Murray early and steal a game in Pittsburgh and return to D.C. to make it a best-of-five with home-ice advantage again. In addition to his goal, Justin Williams was also penalized twice on the evening. Both teams were scoreless on the power play. The Caps were 0 for 4; the Pens 0 for 3. Washington outhit the Penguins 58-25. Marcus Johansson had nine hits to tie Alex Ovechkin for team lead. The Penguins had 19 blocked shots; the Caps six.